Oh, my, it’s AMAZING!!!!! The colours are incredible. I have sat and ran my fingers over such clever and beautiful squares, I’ve sobbed and smiled and have wrapped it round me and S and I sat and spotted the animals! 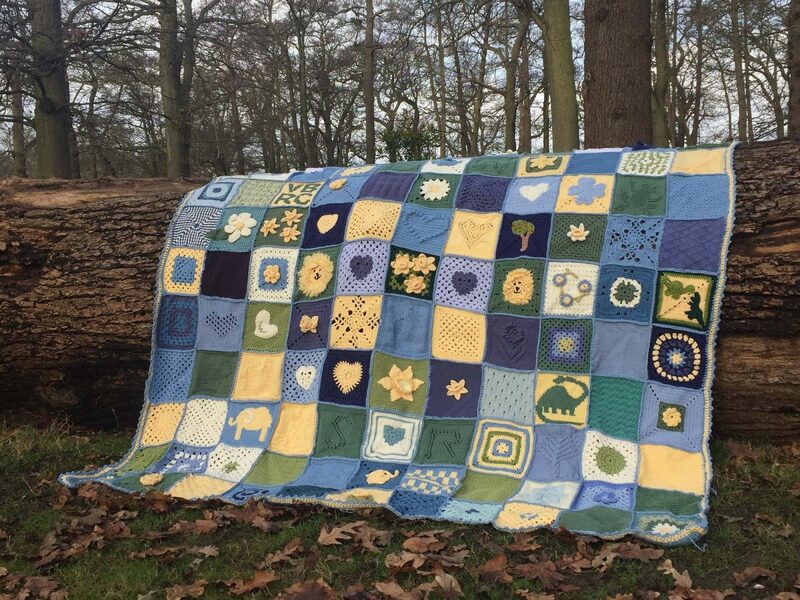 I honestly cannot believe the effort and skill and the time that people have taken to make this blanket for us, William’s anniversary is only a few weeks away and I felt so close to him today whilst looking at it. The bunch of daffodils is just so incredible. I’m so so grateful to the lady that made them, as they aren’t around all year it will be great to be able to concentrate on their brightness in December. They are going to go in a glass vase that belonged to my late wonderful grandma and will take pride of place of my shelf. William and his loss have taught me so much about myself and others this last year and though my heart aches terribly I’m trying to pick up the pieces and find a way through this new life. S is our world and give us a reason to keep smiling through our tears.